I have always hated labels. They feel so all encompassing. So judgmental. So limiting. To be honest, I never really even cared much for astrology. I don’t want to be defined with a “sign” before someone takes the time to truly know me. But then again, technically I am a Taurus, so I guess I’m just living up to the stubborn assumptions. D E P R E S S I O N.
Perhaps it’s because I’ve watched people use labels as a crutch…perhaps it’s because labels and boxes have started wars and great divides. Maybe I’m just terrified of the truth that I may not always be completely strong. But even on my worst day, I never wanted my emotions to be squeezed into a category and reduced to another statistic. I have always been incredibly self aware, and have typically been capable of processing and digesting my feelings (even the negative ones) pretty rapidly. I like to let go, move on, and stay productive. But today, something deep within me was just not going to click into productivity mode. After running some errands this morning, I returned to my little home with every intention to edit, work on some creative projects, respond to emails, and be busy. Instead, I found myself lying in bed with my Troll dog for two hours. Every once in a while, I’d look at my phone and think, “I should respond to that email.” Or, “I should return that business call.” I literally didn’t have the energy to send a text, to work on exciting project opportunities, or to make a phone call about a really great photography gig in Malibu. All I could do was sit — no — LAY — and breathe. I’m hard on myself. I’m good at survival mode, and I’m good at pushing through, staying busy, distracting myself, and making sure the world thinks I’m perfectly fine even when I’m in the midst of a war zone. But some people see beyond even the best attempted facades. As I read that message curled up in my comforter with my dog, I started ugly crying in the worst way. Because I was seen. I wasn’t alone. And she was right. I realized that everything isn’t so synonymous. Humans are far more complex than that. It’s okay that I am a smiley, silly, happy, creative, productive woman who is also going to have hard days. I decided to love myself off of the comforter. I used all of my very little energy and walked across the street to the grocery to grab a coconut water to treat myself and bring a tiny bit of my physical body back to life. 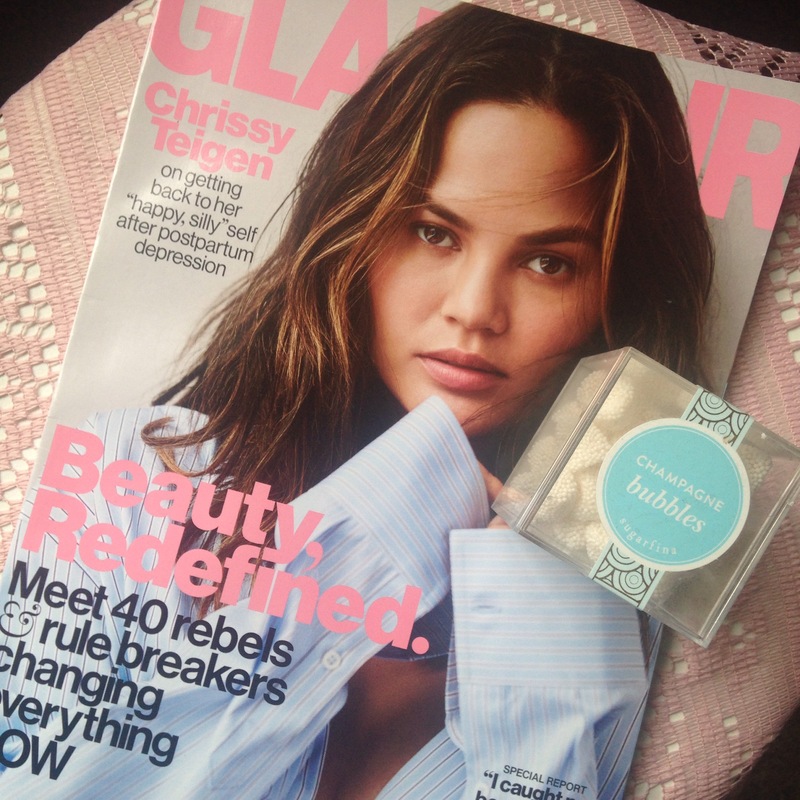 In the checkout line, I saw the Glamour magazine with Chrissy Teigen’s cover story. I never purchase magazines anymore, as I typically find that most of the contents are garbage. But I had already read her story online, and I needed it in print. Back at home, now seated upright in my favorite red chair in my library, I flipped through the pages and read her story again. I figured if Chrissy could be that vulnerable and honest about her postpartum depression with the whole world watching, I could be open about my struggles to the very few people who will read this article. That’s the thing about authenticity — it’s contagious. I could feel the freedom in her writing, and it made me realize that I didn’t need to hide in shame from my own reality. Depression is not who I am. It’s something I may experience from time to time. And if that means I get an excuse to be gentle, buy a magazine, and take an afternoon bubble bath, maybe it isn’t so bad after all. PS: I worked up the strength to make that business phone call. And it was good. Previous postThis time 3 years ago // Part 4: Losing. Adjusting. Reclaiming. Oh authenticity is so beautiful, even what seems like you’re revealing the dark parts. Just as you love those around you who struggle, you too are deeply loved in the midst. Thank you for sharing your journey. I always love hearing your words! !